Chunky Monkey on the beach, his first time at the ocean. He really seemed to like it until a large wave washed up and caught up unexpectedly in some water up to his back. From then on he stayed well away from the water if he could. 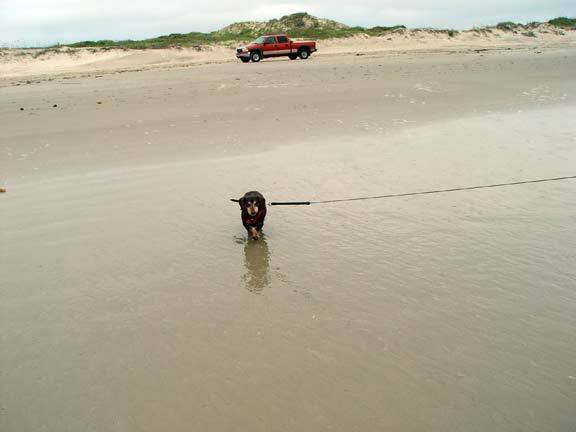 Nonetheless, I think he enjoyed his walk on the beach. So did I. Debbie found a Sand Dollar and lots of sea shells. Thank you for the great picture. Chunky Monkey is precious…hope he is adapting well. Sounds like you guys are having some problems also. I really hope all works out for everyone & you find home again. So hard to start over…thinking good thoughts for you guys. hehe looks like you’ve got a water dog now instead of a weenie dog you need to get him a surf board & a life vest & instead of hanging 10 he’ll be hanging 20 cause he’s got 4 paws. Looks like the tide was out. wonder if monkey would like those waves crashing in on him haha. I am so glad yall had a nice time. I have never been to that beach before but they are so nice and it is so relaxing. Guess that is why I have never left this area. There is just something about it that seems to wash all your worries away for just a little while. I have never felt the peace I feel when standing on the beach or swimming in the water. it is so much greater than I am and I feel so small. Well since I am NOT small, that is a good thing! !